GetHiking! 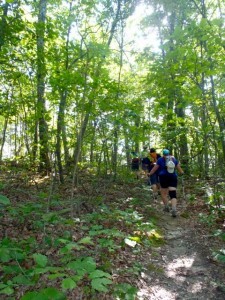 North Carolina's Classic Hikes Archives - GetGoing NC! What constitutes a “classic” hike? asks the author of “100 Classic Hikes in North Carolina” (2007, Mountaineers) and creator of the GetHiking! North Carolina’s Classic Hikes series. 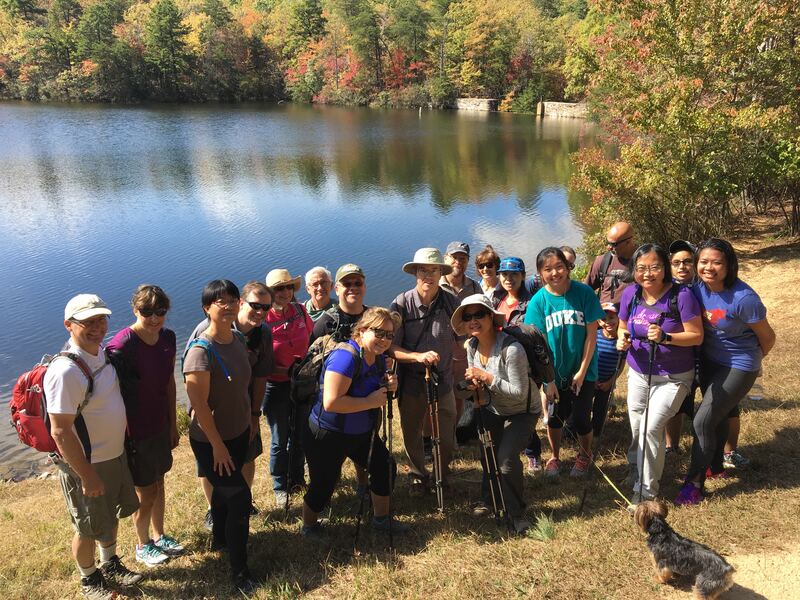 Saturday, 21 of us spent the day on the first of 12 monthly hikes exploring the best trails in North Carolina. The kickoff of GetHiking! North Carolina’s Classic Hikes was a reminder of why we hike. There was the hike itself, at one of the most accessible mountain hiking destinations in the state, Doughton Park. Doughton Park occupies about 7,000 acres cascading down the Blue Ridge Escarpment between Sparta and Elkin. Part of the Blue Ridge Parkway, the 469-acre linear park running through Virginia and North Carolina that’s best known as a classic auto trip, Doughton has 30 miles of trail. Some of our hikers did a 17.2-mile loop that emphasized the escarpment’s dramatic drop of about 2,400 vertical feet from bottom to top and back. 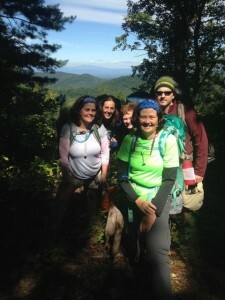 Others did a 7.4-mile hike that stuck to the ridge, along the Bluff Mountain Trail. The ascent and descent for the long group built a healthy appreciation for how abruptly the Southern Appalachians rise from the Piedmont; the passage through rolling meadow after rolling meadow along the ridge offered hike-stopping views rare in our heavily wooded mountains. And there were the hikers. There’s something about spending a full day on the trail together that builds the kind of comfort and trust we tend to think can only be achieved as kids. You feel more at ease to ask questions, more at ease to answer them, more at ease to be yourself. Take Bill. I’ve been hiking with Bill for more than a year and a half. I know him as one of the most decent people I’ve met, but because he typically hikes at the front of the pack and I’m in the back, we rarely get to talk. On this all-day trip, we did. I knew Bill was from New England originally and was a big hockey fan. Had, until recently, played. The way he’d talked in the past, I’d assumed he was a long-time rec league player. In passing, he mentioned having to take time off from the auto body shop he ran years ago to play for the Maine Mariners. With a little cajoling, he acknowledged they were a semi-pro club affiliated with the Boston Bruins. My respect for his modesty prevents me from sharing more. There was Kevin, who allowed that his new, leather hiking boots were killing him, but that he’d been assured by devotees of the boot that after the break-in period, he would love them. “How long does it take to break ‘em in?” I asked. There was Jean, who took up hiking six years ago and, now 65 out-hiked the lot of us (and entertained us with news of a gruesome murder over lunch), and there was Gene, who’s dad I worked with in a previous life. I lived vicariously through Hale’s tales of his son, who lives the classic nomadic outdoor life out West, I listened with humility as Ruthann pointed out every climb I’d forgotten to mention. I avoided talking work with Lisa (we don’t work together, but she and my wife are magazine editors with the same publisher), and was delighted to see Sue approach from the opposite direction with news of her delayed arrival at the trailhead (two hours after the rest of us had shoved off). It didn’t hurt that we had perfect weather — temperature in the low 50s, the occasional wispy, white cloud. But I think this group would have weathered a monsoon in good humor. Doughton ParkGetHiking!GetHiking! 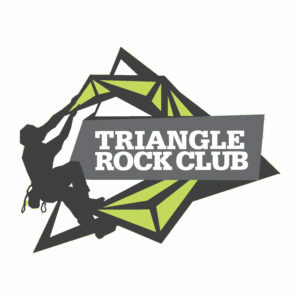 North Carolina's Classic HikesGreat Outdoor Provision Co.